The NCAA named Minneapolis one of eight finalists to host a future men's Final Four. The other cities are Atlanta, Indianapolis, New Orleans, North Texas, Phoenix/Glendale, St. Louis and San Antonio. ST. PAUL, Minn. — Minnesota’s new billion-dollar, multi-use stadium is in the initial building stages, but it could start paying dividends for the city of Minneapolis and the state of Minnesota. State and community leadership, including the Minnesota Sports Facilities Authority and the building’s main tenants, the Minnesota Vikings, are wasting no time in trying to line up premier events for the enclosed stadium set to open in 2016. On the same day Minnesota governor Mark Dayton announced the formal plans for state, community and business leaders to join the Vikings’ bid for the Super Bowl, the NCAA announced Minneapolis as one of eight finalists to host a men’s basketball Final Four tournament between 2017-20. The University of Minnesota and Meet Minneapolis has joined in the effort to bring another Final Four to Minneapolis. The other finalists along with Minneapolis are Atlanta, Indianapolis, New Orleans, North Texas, Phoenix/Glendale, St. Louis and San Antonio. "We are very excited that even before the new stadium has been built that (it) has attracted such strong interest in premiere sporting events," MSFA chair Michele Kelm-Helgen said in a statement. "The public investment in the new stadium has spurred a $400 million private investment by Wells Fargo and Ryan Companies, and if we are fortunate enough to host both of these events, it means hundreds of millions of dollars for local businesses, the city and state." Earlier in the day, Dayton announced co-chairs in the effort to draw the Super Bowl to the new stadium after the team was named a finalist for the 2018 game. Dayton said the economic impact of bringing the Super Bowl to town could generate nearly a half-billion dollars. The 2013 men’s Final Four was held in Atlanta, and the Atlanta Visitor and Convention Bureau estimates that the events generated more than $70 million for the city, according to a release from the MSFA. Completed bids from each location are due in May and the tournament will be awarded to one of the finalists in November. "The committee and staff have been thoroughly impressed with the quality of bids, the level of detail and the incredible enthusiasm that the individuals behind each bid have demonstrated thus far in the process," NCAA vice president for men’s basketball Dan Gavitt said in a release on the NCAA’s website. "The Men’s Final Four has grown into one of the biggest and best sporting events in the world, so it’s easy to understand why these cities would put their best foot forward in attempt to secure a bid. We fully expect the remainder of the bid process to be competitive, and while it’s obvious that there are difficult decisions ahead, we also know that based on what we have seen so far from these prospective hosts, we are going to have great Final Fours in the coming years." Like the Super Bowl, Minneapolis has hosted the Final Four at the Metrodome, which is being replaced after 32 years. 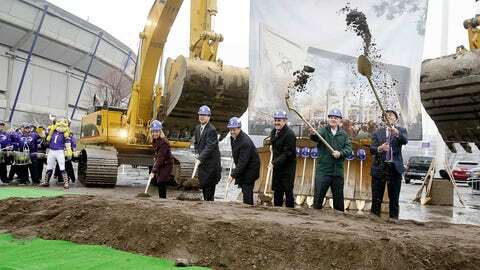 Minneapolis and the state approved funding for the $975 billion stadium in 2012 and construction has begun on the site where the Metrodome currently sits. The Metrodome hosted the Final Four in 1992 and 2001.The Twin Cities have also hosted several regionals. The cities among the eight finalists have combined to host 24 men’s Final Fours as well as the next two events. Indianapolis has hosted the event six times, while New Orleans has been the host five times. Coincidentally, Indianapolis and New Orleans are the finalists along with Minnesota for the Super Bowl in 2018.